**With their win against Leavenworth on Friday, SM East notched their ninth win of the season, which is the most wins the school has ever had in any one single season in their 58-year history. **Olathe North and Olathe East, two of the Sunflower League's better defenses, put the clamps down on EKL foes Gardner-Edgerton and BV Northwest, respectively, holding the two to a combined 10 points. Given the EKL is known for their high powered offenses, the efforts were impressive. **The two top seeded teams remaining, Free State and SM East, will have to travel on the road to ODAC and CBAC, respectively, for Sectionals. This antiquated KSHSAA rule of of not granting the top seeds home field advantage throughout the playoffs needs to be addressed, as it's a problem that seems to reoccur annually. **Friday was the last game for Leavenworth's Jason Randall, a player who impacted the Pioneer program perhaps more than any one player did for any program over the last decade. All told, he rushed for 35 touchdowns and just over 3,600 rushing yards in three and half years of varsity football. **Both Leavenworth and SM Northwest held first half leads, however the two combined to be outscored 39-0 in the second halves of their games. **The trend of the "haves" and "have nots" continues in the Sunflower League, as there really aren't any new teams making a splash this deep in the season. Each of the four teams in Sectionals have made it this far within the past two seasons -- meanwhile, Leavenworth, Olathe Northwest, SM North and SM South have yet to make it this far in the past decade. Joe Dineen, Lawrence Free State: Dineen completed seven of his 15 passes for 134 yards and two touchdowns, and carried the ball 14 times for 72 yards and two touchdowns. Simply put, when Dineen starts making plays, Free State is hard to beat. 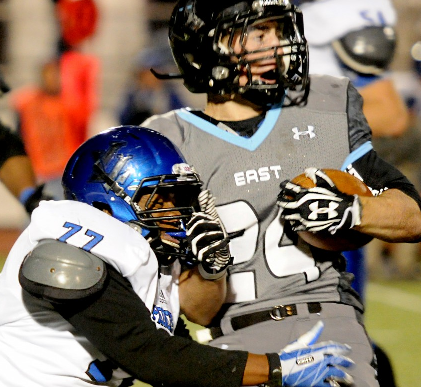 Nathan Guthrie, Olathe East: Guthrie's stat line wasn't the most impressive we've seen all year -- he recorded eight tackles, recovered a fumble and had one tackle for loss -- but Jeff Meyers cited Guthrie as the primary reason the Hawks were able to keep Traevohn Wrench's yards per carry down, and most importantly, out of the end zone. Leavenworth: The Pioneers capped the season at 3-7, but the improvement from their week one 34-0 disaster loss against SM East was evident. The program has gained the respect of their Sunflower League peers, and that's something they didn't have just three years ago. SM Northwest: The Cougars season ended in underwhelming fashion (especially considering they jumped out to a 14-0 lead), but they have much to be optimistic about going forward. Primarily the fact they played quite a few non-seniors which should make the transition to next fall easier. Exactly, Eli! What benefit is there for a team to go 8-1 (as FS & SME did) and not have a home field advantage through the playoffs as a top two seed? Earning that seed should mean something!! In this stupid system, it actually penalizes teams for having a great year by being a host for the first round and then have to travel, in most cases, for the second round in what is almost always a tougher game. For FS this year, it means playing ON on the road twice. Last year, FS had to play SMW twice on the road. OK, I am off my soapbox now. :o) Go 'Birds! I would not disagree that the better seed should get to host a playoff game but in the end its high school football and it not that big of an advantage. I never once thought the Eagles had more or less of a chance to win because it was home or away. But don't forget, LFS has probably more overall team speed and now they get to play on that crappy grass field that Olathe School district keeps around. Slows down the Firebirds and lets that really good Eagle defense pursue and swarm the ball like they do so well. I think this gives ON a bit of an advantage. I was a little surprised by the comment Joe Dineen made in the Lawrence paper. " Their defense is pretty good but nothing we can't handle". Great chalkboard material !! Somebody needs to tell Mr. Dineen that Norths defense over the last four weeks has played arguably the stingiest of any defense in the region. Their linebackers may be the best group I've seen in years. Turnover ratio is off the charts. Considering the fact that their playing on grass at ODAC, North has a decided advantage in this game. Oops, problems posting from phone. Freestate players probably have a false sense of security after last weeks game. They need to remember the rocket launched punt snap that SMNW downed at the 1 instead of taking a safety. Then there was the forward pass Dineen made 2 yds past the line of scrimage that led to a 1st and a td on that play. Last but not least the out right refusal of SMNW offense to adjust and take what LFS was giving them. ON will not make the same mistakes as SMNW. Does anyone know if the same officiating crew will be working ON/LFS game as worked the LFS/SMNW game? Make your Sunflower League game predictions in the comments section of this post. Standings will be updated weekly by TheImpaler. The Simone Award is handed out annually to the top high school football player in the Kansas City metropolitan area. Winners from the Sunflower League are in bold. Copyright © 2008-2014 Elias Underwood. All Rights Reserved. Powered by Blogger.